The USS SPRINGFIELD (CLG-7), a Cleveland class light cruiser, was commissioned on 9 SEP 1944 as CL-66. After her service in both the Atlantic and Pacific in WW II, she was decommissioned in 1949. In the late 1950s she underwent a retro-fit as a guided missile cruiser and was recommissioned on 2 JUL 1960 as CLG-7. USS SPRINGFIELD (CLG-7) served her country for nearly fourteen years, until decommissioned on 15 MAY 1974. USS SPRINGFIELD spent most of the 1960s in the Mediterranean as the Flag Ship of the Commander of the 6th Fleet, then in Norfolk as the Flag Ship of the Commander of the 2nd Fleet. In 1970 she returned to the Mediterranean as Flag Ship of the Commander of the 6th Fleet until SEP 1973. USS SPRINGFIELD returned to the United States and was decommissioned in 1974. She was sold for dismantling in 1980. The third Springfield (CL-66) was laid down on 13 February 1943 by Bethlehem Steel Co. at its Fore River yard, Quincy, Mass. ; launched on 9 March 1944; co-sponsored by Mrs. Angelina Bertera and Miss Norma McCurley; and commissioned on 9 September 1944 at Boston, Mass., Capt. Felix L. Johnson in command. On 7 November, the light cruiser headed out of Boston harbor on her maiden voyage. Two days later, she put in at Norfolk, Va.; and, after several days of gunnery practice in the Chesapeake Bay, she started south for the British West Indies. The ship arrived in the Gulf of Paria, Trinidad, on the 21st and conducted shakedown training in that area during the following month. Springfield completed her shakedown training on 21 December and sailed back to Boston. She steamed out of Boston again on 10 January 1945 to conduct further training exercises in the vicinity of Bermuda. At the completion of this assignment, Springfield cleared the area for Norfolk on the 13th. She remained in the Norfolk area and engaged in upkeep and gunnery drills in the Chesapeake Bay until 23 January. That morning, she weighed anchor and joined Task Group (TG) 21.5 off the entrance to Thimble Shoal Channel to accompany Quincy (CA-71) on the first leg of the heavy cruiser's voyage to Malta carrying President Roosevelt. There, the President would board a plane to take him to the Crimea for the "Big Three" conference at Yalta. On the 28th, at a point about 300 miles south of the Azores, the ships of TG 21.5 were relieved by another group of American warships, and Springfield headed for the Panama Canal. She transited the canal on 5 February and arrived in Pearl Harbor on the 16th. The light cruiser spent five days there taking on water, fuel, stores, and ammunition; and conducting antiaircraft gunnery practice before getting underway for the western Pacific. She stopped at Eniwetok Atoll on 2 March and arrived at Ulithi Atoll on the 6th. Springfield stood out of Ulithi on 14 March and joined the Fast Carrier Task Force (TF 58) on the next day. For the next two and one-half months, Springfield cruised with TF 58. After a raid on Kyushu and Honshu on 18 and 19 March, the task force zeroed in on Okinawa. From 23 March until 1 April, the cruiser helped ward off enemy air attacks while the carriers launched their planes to weaken the island's defenses. On 27 and 28 March, the light cruiser herself joined in the softening-up operation as she brought her guns to bear on Minami Daito Shima. After the assault of 1 April 1945, the carriers' role changed from one of preparation to one of support to the invasion troops on Okinawa. Springfield's mission, however, remained the same-to protect the carriers. For almost two months, she sailed in the huge screen of TF 58 to the east and southeast of Okinawa. Her crew members were subjected to frequent calls to general quarters, and they fought and watched as Japan's "Divine Wind" blew itself out against the combined strength of American combat air patrols and the surface antiaircraft screen. Her guns destroyed at least three enemy suicide planes. On 17 April, just after she had splashed one Japanese plane, Springfield narrowly escaped the fate of many of her sister ships when a kamikaze attempted to crash her. Due to quick thinking and good seamanship, she dodged the plane which splashed harmlessly into the sea a scant 50 yards away. On 10 and 11 May, Springfield departed from _the antiaircraft screen to bombard Minami Daito Shima again. During the period from 23 March to 28 May, she left the Okinawa area only once, on 13 and 14 May, when she sailed with TF 58 to strike at Japanese air bases on Kyushu. On 27 May 1945, the 5th Fleet was redesignated the 3d Fleet when Admiral Halsey relieved Admiral Spruance. Three days later, Springfield anchored in San Pedro Bay at Leyte in the Philippines for maintenance and upkeep. One month later, she departed Leyte and joined TF 38 for further air strikes against the Japanese home islands. On July 10th and 11th, the carriers launched planes against Tokyo. On the 13th and 14th, their targets were northern Honshu and Hokkaido. The task force conducted an antishipping sweep along the coast of Honshu on the night of 14 and 15 July, and then, two days later, returned to hit Tokyo and Yokohama again. The planes bombed battleships Nagato and Haruna, on 18 July; then pounded Kobe and Kure on 24, 25, and 28 July. Springfield joined in a bombardment again on the night of 24 and 25 July; this time the targets were shore installations on southern Honshu. On 30 July, Tokyo once more suffered from the wrath of the flattops. Sweeping the coast of Honshu for enemy ships as they went, TF 38 returned to bomb northern Honshu and Hokkaido on 9 and 10 August. Three days later, the carriers sent their planes against Tokyo for the last raid of the war-on the 15th, hostilities in the Pacific ended. Springfield entered Sagami Wan with TF 35 and anchored there on 27 August. Three days later, she covered both the entry of TF 31 into Tokyo Bay and the occupation of the Yokosuka Naval Base; and then returned to her anchorage. On 3 September, the light cruiser entered Tokyo Bay itself. On 20 September, while she was still in Tokyo Bay, the 3d Fleet became the 5th Fleet again upon the return of Admiral Spruance. Springfield remained in the Far East until early January 1946. During the intervening three months, she visited Sasebo and Yokosuka in Japan; Shanghai, Taku, Tsingtao, and Chinwangtao in China; and Jinsen, Korea. On 9 January 1946, she departed Tsingtao and headed east. She arrived in San Pedro, Calif., on 25 January en route to the navy yard at Mare Island. The light cruiser returned to San Pedro on the 15th. She operated along the west coast until 1 November, when she headed back to the western Pacific. Springfield arrived at Guam on the 15th and operated in the Marianas, primarily between Guam and Saipan, until 19 February 1947. She stopped at Kwajalein Atoll from 25 to 27 February; then continued east. After a week stopover at Pearl Harbor, 11 to 18 March, she got underway for San Pedro, Calif., and arrived on 24 March 1947. Springfield operated along the west coast for just over 18 months, before voyaging again to the Far East. She reached Yokosuka on 3 November and cruised with the 7th Fleet until mid-May. During this deployment, she visited such familiar places as Sasebo, Yokosuka, Kure, Tsingtao, Shanghai, and Okinawa; and stopped at Hakodate and Otaru in Japan, and Hong Kong, all three of which were new ports of call to the light cruiser. She returned to the west coast again on 1 June 1949 and three and one-half months later, commenced inactivation overhaul. In January 1950, Springfield joined the San Francisco Group of the Pacific Reserve Fleet. Springfield remained berthed at San Francisco until March 1959. At that time, she was towed from the west coast, via the Panama Canal, to Boston, Mass. On 15 May, she returned to the Fore River yard of the Bethlehem Steel Co. at Quincy, Mass., to be converted to a Providence-class Terrier guided-missile cruiser, and redesignated CLG-7. Springfield's conversion took more than three years, with the last three months of work being completed at the Boston Naval Shipyard. On 2 July 1960, she recommissioned at Boston, under the command of Capt. Francis D. Boyle. Between early July and November of 1960, Springfield conducted acceptance trials off the New England coast and shakedown training in the vicinity of Guantanamo Bay, Cuba. On 4 December, she stood out of Boston and headed for the Mediterranean Sea. Ten days later, she relieved Des Moines (CA-134) as flagship of the Commander, 6th Fleet. With the exception of the period from 11 May to 15 December 1963 which she spent in overhaul at Boston, Springfield cruised continuously with the 6th Fleet until 1967. During these years, she visited all the major ports of the Mediterranean, as well as some less well-known cities such as Dubrovnik and Split in Yugoslavia; Famagusta, Cyprus; and Ajaccio, Corsica. She also joined other units of the fleet and those of other nations in numerous national and multinational exercises. In addition, her role as flagship meant that many dignitaries visited her; among her guests were Constantine, King of Greece; Princess Grace of Monaco; several dozen ambassadors; and a host of prominent military figures. On 20 January 1967, Springfield's home port was changed from Villefranche-sur-Mer, on the French Riviera, to Boston, Mass. Eight days later, she turned her duties as flagship over to Little Rock (CLG-4) and headed, via Portsmouth, England, to the United States. 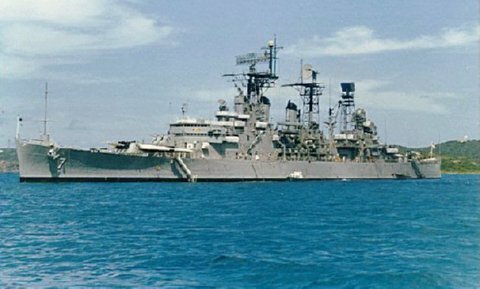 The guided-missile cruiser arrived in Boston on 16 February 1967 and immediately began a six-month yard overhaul. On 1 August, near the completion of the yard period, Springfield again changed home ports -this time to Norfolk, Va. She arrived at Yorktown, Va., on 6 August and, on 1 September, relieved Newport News (CA-148) as flagship of the Commander, 2d Fleet. She moved south in early September to the Atlantic Fleet Weapons Range, where she fired several missiles and conducted gunnery exercises. After fueling at Roosevelt Roads, Puerto Rico, the guided-missile cruiser sailed for Portsmouth, England, the first stop on an itinerary which also included Amsterdam in the Netherlands; Lisbon, Portugal; Barcelona, Spain; and Pollensa Bay at Majorca. Springfield returned to Norfolk on 6 November. For the next 10 months, she operated out of Norfolk, conducting exercises and participating in a midshipman cruise. On 12 September 1968, Springfield headed northeast across the Atlantic to join NATO exercise Silver Tower in the Norwegian Sea north of the Arctic Circle. On 27 September, she cleared the exercise area and sailed south. Stopping at Oslo, Norway; Le Havre, France; Lisbon, Portugal; and Portsmouth, England; she made Rota, Spain, on 23 October. There, another conference was held between the commanders of the 2d and 6th Fleets. Springfield departed Rota on the 24th and sailed back to Norfolk, where she arrived on 1 November. She resumed normal operations out of Norfok until 8 July, when the Commander, 2d Fleet, shifted his flag to Newport News in order that Springfield might prepare for and commence a restricted availability. On 14 January 1970, Springfield relieved Newport News again as flagship of the 2d Fleet. However, seven months later, the commander's flag returned to Newport News; and, on 10 August, Springfield headed back to the Mediterranean. On the 22d, she relieved Little Rock as flagship of the 6th Fleet. The guided-missile cruiser spent almost four years cruising with the American fleet in the Mediterranean. During that time, she resumed her routine of exercises and diplomacy, hosting many dignitaries, among whom were President Nixon and the Secretary of the Navy. She passed through the Straits of Gibraltar on four occasions during that time, visiting Casablanca, Morocco, and Lisbon, Portugal, twice each. Otherwise, she remained in the Mediterranean Sea until relieved by Little Rock again on 1 September 1973. Springfield earned two battle stars during World War II.